Whoa! I had no idea there were so many different kinds of borsch. I'd always assumed that borsch was, well, borsch - basic beet soup. But, in fact, the word borsch simply means any soup made with a variety of vegetables, and in Eastern Europe, there are hundreds of varieties, each one considered authentic. Some have beef, some have sausage, some have bacon and still others have a whole range of vegetables. Since I often cook with meat, I decided to go the vegetarian route, opting instead to made a simple soup where the beautiful earthy beet flavor would be the star. Pure in flavor, spectacular in color and loaded with vitamins, borsch is now officially on my "this is surprisingly awesome" list of foods. Oh, and don't forget to serve it with hearty pumpernickel, slathered with sweet butter. Epic. Located in southeastern central Europe, Ukraine borders Russia, Belarus, Moldova, Slovakia, Romania, Hungary, Poland, Russia, Georgia, Bulgaria, Turkey the Black Sea and the Sea of Azor. The second largest contiguous country on the European continent after Russia, this beautiful country is extremely bio-diverse, and is home to thousands of plants, mushrooms, berries and animals. Established in the 9th century by the Varangiansin, the country was a powerful nation in the Middle Ages. By the 14th century, Ukraine was under the rule of the Golden Horde, the Grand Duchy of Lithuania and the Kingdom of Poland and by the 19 century, the largest part of Ukraine was integrated into the Russian Empire. From 1917-1921, the country fought for independence, following WWI and the Russian Civil War. Finally, when the Soviet Union disolved in 1991, Ukraine declared independence. 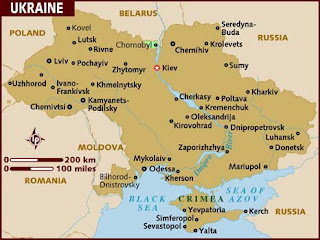 Today, Ukraine is a globably important country and is the 3rd largest grain exporter in the world. Cuisine in Ukraine is influenced by Russian, Polish, German and Turkish traditions. Meat, mushrooms, vegetables, berries, fruits and herbs are abundant in Ukranian cooking. Called the "breadbasket" of Europe, bread in many forms and cooking methods is integral to the countries culinary identity. Pickled vegetables, dumplings, cabbage, beets, cheese, pork, fish, lamb, potatoes, tortes, nuts poppy seed pastry and cakes are all typical of the country's cuisine. Chop carrot, onions and beets. Add to pot and barely cover with boiling water. Simmer gently, covered for about 20 minutes. Add butter, stock, shredded cabbage and vinegar and simmer for another 15 minutes. When cooked, blend or run soup through a food mill until desired consistency. Ladle into bowls, top with a dollop of sour cream, a spoonful of cucumber and sprinkling of dill. Serve with good pumpernickel bread and butter. This is on my short list. I've already cooked both Russia and the Ukraine, so this is just one of those recipes I'll make just because!! Great post! In the tall glass... thought it was some fancy dessert or alcoholic beverage! I decided it could be served as a "shooter" in a small glass as an appetizer! But mixing with a a little vodka could be interesting!